Why you should put your phone away and turn to a timepiece instead. Gigi Hadid’s collaboration with Tommy Hilfiger has been a sell-out four-season success, culminating in Drive – a final collection inspired by the designer’s love of motor sports. While the ready-to-wear collection features a range of race-worthy separates and outerwear (from grid prints to track-side tracksuits), the collaboration also includes Hadid’s third timepiece for the brand – the Drive Master watch. 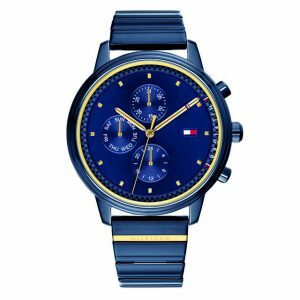 The women’s timepiece features a high-shine midnight blue strap and casing, with gold hardware and a checked-flag minute dial around the edge of the face. While the 22-year-old is no stranger to turning her hand to clothing design, creating a watch requires a totally different skill set. But with everyone having a smartphone, tablet or screen within arm’s reach at all times, is there really a need for a traditional timepiece in quite the same way as before? Absolutely, says Hadid, pointing out that it can, in fact, help to encourage you to step away from your phone. And when it looks as good as this one, it’s easy to see why. A spirited scent for the rebellious heart. Three of Malaysia’s prominent athletes show us how they celebrate life with MCM.